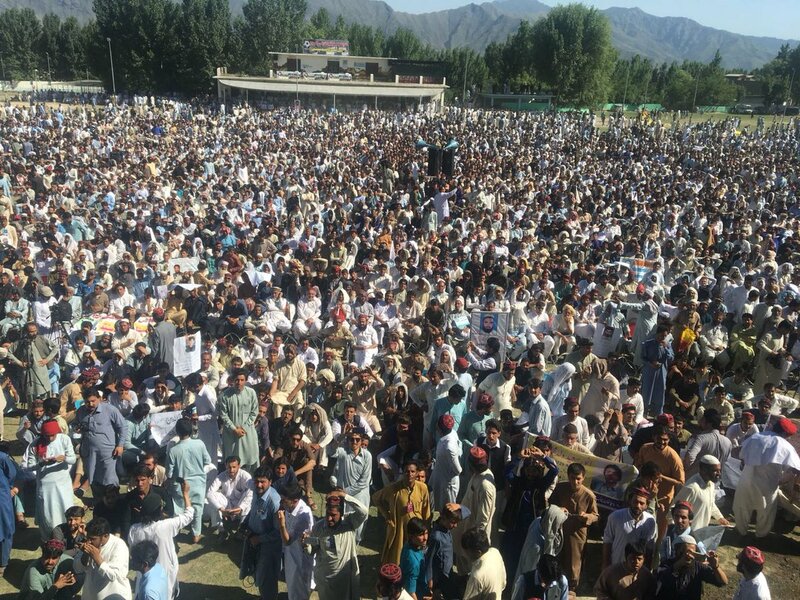 PESHAWAR: The indigenously emerged Pashtun Tahaffuz Movement (PTM), despite opposition and hurdles, succeeded in holding a well-attended rally at Kabal ground of Swat district on Sunday whereas Manzoor Pashteen and his aides reaffirmed their stance of continuing struggle till resolution of security-related and administrative problems for Pakhtuns in Federally Administered Tribal Areas (FATA) and throughout the country. The rally was attended mostly by young Pakhtuns from all over the country, but the majority of the participants belonged to scattered areas of Swat and other districts of Malakand division. The organisers complained that the rally’s participants arriving to Swat from all four sides – Malakand, Dir, Shangla and Buner – were stopped for prolonged checking and complete search before allowing the entry. According to one organiser, the most hectic search was registered at Dagai Malakand and Karakar Buner where entry of each and every person along with their vehicle was noted down before entry into Swat valley. Dr Said Alam Mehsud, an active member of PTM, informed that around 200 vehicles, mostly hiaces and coaches, remained in long queues for hours at Dargai. Whereas Zahid Wazir, another PTM stalwart, said that each person and the vehicle remained in Dargai for around two hours. The situation turned tense when a group of PTM workers assembled on a check-point and staged a protest by chanting slogans against the security forces personnel and government. And as a result, the security checking and registration process became expedited. At a military check post in Behrain, the activists of Pakistan Zindabad Movement and Pakistan Tahaffuz Tehreek blocked a convoy of the PTM activists from Kalam. The situation got intense when slogans were raised against each other. Abdullah Nangayal alleged that the civil administration and law enforcing agencies had attempted to diffuse the PTM rally but their plans were foiled as around 20 thousand people turned up at the rally. During the rally, a youngster accompanied by two of his fellows made an attempt to enter the PTM’s Swat rally while holding the national flag. However, he was denied the entry and during this period, he made a video which went viral over the social media. It enabled the PTM’s rivals of levelling allegations of being anti-national against the movement and its leaders like Pashteen as well as his aides. However, PTM leader Abdullah Nangyal, while addressing from the stage, clarified the situation, saying that it was a move to damage the image of the movement. The rivals created a pre-planned opportunity to malign the tehrik, he added. He made it clear that they are patriotic citizens of the country and had established the PTM to get their rights according to the 1973 Constitution of Pakistan. Meanwhile, a large number of women turned to the rally and narrated tales of their close relatives including sons, brothers, husbands and others before media persons. Many of these women reached Swat from Islamabad and Peshawar. On numerous occasions, participants – mostly youngsters – chanted slogans against the government and security forces. Beside Manzoor Ahmad Pashteen, the rally was also addressed by a number of other PTM stalwarts like Mohsin Dawar, Ali Wazir, and Dr Said Alam Mehsud. The speakers maintained that all their demands were in accordance with the Constitution, complaining about the ‘baseless allegations’ levelled against them. They urged the government to take early steps for the acceptance of their demands, and warned the authorities to continue their protest in case the demands were not addressed. The participants voiced their concerns, the right of survival and issue of enforced disappearances and missing persons. Except Pakhtunkhwa Milli Awami Party (PkMAP) of Mehmood Khan Achakzai, remaining political parties kept their distance with the Swat rally. Mukhtyar Yousafzai, President of PkMAP Khyber Pakhtunkhwa, led a party delegation and delivered a brief speech supporting the PTM struggle. The nationalist Awami National Party having a stronghold in Swat and its surrounding district neither opposed nor supported the rally. However, a large number ANP workers turned up at the rally.